Alex has spent a lifetime in the sewing industry and is considered one of the foremost experts of pioneering machines and their inventors. He has written extensively for trade magazines, radio, television, books and publications world wide. They say that Vickers was once the largest employer in Britain employing tens-of-thousands of workers. The giant company has faded but it has left us with a legacy of quality that still continues to this today in its products. But why was this massive concern making sewing machines? Now funny things happen with history. Just before the outbreak of WWI, around 1914, the giant Vickers Corporation started looking at sewing machines. The company had, throughout its history, continually diversified and expanded. At their peek the company was said to employ over 70,000 people around the country, from ship building to steel castings, torpedoes to machine guns. In fact, as one of the countries largest employers, they seemed to have their fingers in many pies. 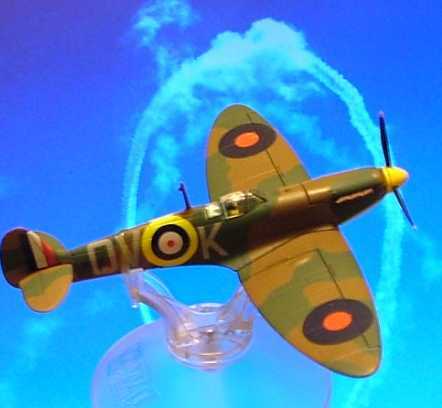 In the Second World War they were responsible for producing the amazing Supermarine Spitfire, which along with its Merlin Rolls Royce engine and its faithful partner, the Hurricane, helped save England in its darkest hour. It was not just Vickers that made sewing machines when things were quiet. Notice the name. In 1914 Vickers was looking to diversify and sought out products to make after the war had finished that could be profitable in peacetime. Everyone thought that the Great War that was supposed to be over by Christmas! Their gaze fell upon the humble sewing machine that every household wanted and the market was expanding. There was also another benefit. Many of the German manufacturers of sewing machines were not able to sell their products to The British Empire, leaving a huge hole in the market that Vickers could jump into. Even better, the giant German Frister & Rossmann company were about to launch a new sewing machine. Not only were Vickers going to copy their machine but they would steal their market as well. Well, what could the Germans do about it? At the time Frister & Rossmann’s were being imported from Berlin by an importer called Pierssene. He must have known that importing from Germany, when they went to war, would be difficult if not impossible. As the writer Sir Arthur Conan Doyle said, every man knew war was coming. Pierssene possibly looked around Britain to find another manufacturer to supplement his supplies and keep his market going. His eye fell upon Vickers, or was it the other way around? Anyway it was a perfect match, he was an importer with all the designs, agents and markets, and they were a company that seemed to be able to make just about anything they set their minds to. After some appraisals Vickers approved the idea and a site was sought to make their first sewing machines. An image of industrial espionage jumps to mind of the former importer running off with the plans of F&R's new machine to Vickers. Mind you that, in turn, was just a copy of a Singer-with an added reverse stitch anyway. Most of the patents had run out by then and could not cover their new model, so basically anyone could copy it. There's no love lost in the sewing machine industry. Now, the funny thing is that Vickers and Frister & Rossmann ended up having the same address in London, 24/25 Fore Street. So it was probably all above board and I haven't yet uncovered the facts. It appears that Vickers just took over the premises where F&R left off. It could be that simple, Pierssene had arranged the whole thing as a sewing machine importer/distributor/agent. He needed to secure supplies during war and Vickers could plug the hole. I cannot imagine that F&R were happy about their British distributor selling an almost identical model to theirs but what could they do! So he did stay at the same premises at the same time as taking on Vickers and handling F&R machines or just switch stock? Can you imagine the warehouse with both competitors machines stacked side by side? It did not do Pierssene any good for by 1919, as the war came to a close, a new agent was procured by F&R. There were various court actions by Pierssene to try and carry on with the import rights to F&R but they failed and a new agent, Quitmann, won the day. The name Quitmann now appears as the main importer and agent for F&R machines and Pierssene all but disappears. I cannot find any trace of him with Vickers either. So the man who may have set up the whole idea seems to disappear. Time to read my History of Frister & Rossmann. Vickers was now in the sewing machine business and there was nothing the Berlin F&R Company or any of the other German companies could do about it. They were now the enemy and no machine with Made in Berlin or Made in Germany stamped on the bed would sell in Britain. After the Great War, to try and help German sales of sewing machines, all identification as to the origin of the German machines place of manufacture was removed from their machines. Many machines survive today with the badges pulled off by local dealers in the 1920's. 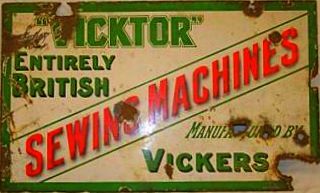 Now that we see the split in importers and how Vickers came up with its first machine, let us get back to the Vickers sewing machine. Vickers machines, All British and a true economy. Wise spending is your duty! Buy British. So, this is the era that the Vickers "Modele de Luxe" appears on the market. It is from this fascinating chapter in our sewing machine history that Vickers saw an opportunity and came into the sewing machine business. Although their offices for the sewing machines were at Vickers House in Westminster, Vickers built a factory in Crayford, London, to handle the sewing machines and Wimbledon. Labour and material shortages, and a massive output toward the war effort, made production of the sewing machine a long and arduous task. However they persevered knowing that in peacetime there was little demand for machine guns but a huge demand for sewing machines. Every house in the country wanted one and even Singer could not supply the demand. So throughout the war their head engineer, Charles Edward Francis, carried on with improvements to the basic model. In October 1917 they applied for improvements to their sewing machine, although it was not accepted and the patent granted until January of 1919. They were once again looking forward and it paid off. After hostilities ended they used a lots of the machinery that had made the Vickers weapons of war for sewing machine production. What a revelation! During the war huge advances had been made in technology but Vickers stuck with the old F&R patterns with their slight modifications to the reverse lever and shuttle (patent No 122,432). This was the opposite to their plane production. On the 14th of June 1919 a Vickers twin-engined Vimy Mk 4 Bomber took off from America and made the first successful crossing of the Atlantic. The Rolls Royce Eagle III engined bi-plane landed in Ireland 16 hours and 27 minutes later. Alcock & Brown had made history and also claimed the £10,000 prize offered by the Daily Mail. We are jumping ahead we need to go back a step or two. The biggest problem the mighty Vickers Company came up against was actually making one of the smallest items, the bobbin or shuttle case. This little marvel required over 100 separate handling operations to get perfect and it had to be perfect. With a VS or Vibrating Shuttle machine the tension and smoothness of the shuttle is vital in getting a perfect stitch. Eventually mastered by Charles Francis they were on their way. 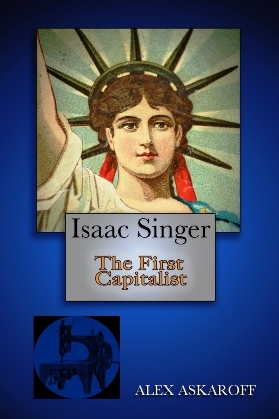 By 1916 they were well underway with a copy of Singers model 28 VS machine, a sturdy simple machine identical, except for the reverse and winder, to Frister & Rossmann's own copy of Singers best seller, confused? you should try writing it! Due to the war and a shortage of man-power, production was slow. 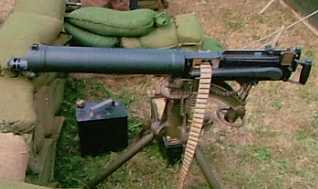 Other machines, like the Vickers Machine Gun, took priority. Strangely enough the man-power solution was right in front of them. The first, war-era, sewing machines ended up being partly made by German internees who were being held in England and went to work for Vickers, returning to their camps at night. It was not forced labour, anyone not wishing to participate would be allowed to go back to camp whenever they wished. 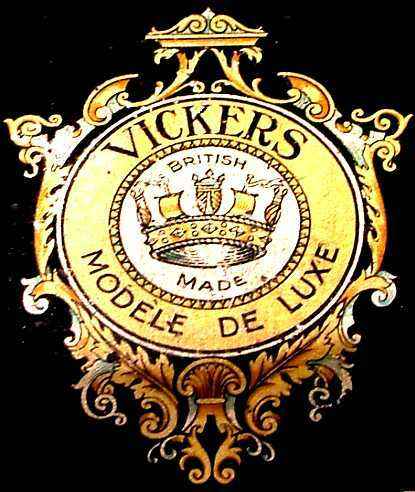 Although Vickers had started the long setup and manufacturing process of sewing machines in 1914, their first machine was not available to view until 1917. That was at Harrods for £4. Orders could be placed for the machine that would replace Frister & Rossmann machines from the shops for more than a decade. By 1919, with Pierssene, using his old F&R connections, and still operating from his Fore Street address in London Vickers machines were being supplied instead of F&R machines to shops up and down the country. When, after the war, Frister & Rossmann were allowed to import machines again they had lost a sizable chunk of their market to the British giants. Metal that would have been made into weapons was now being made into sewing machines. The world had turned from war to peace. 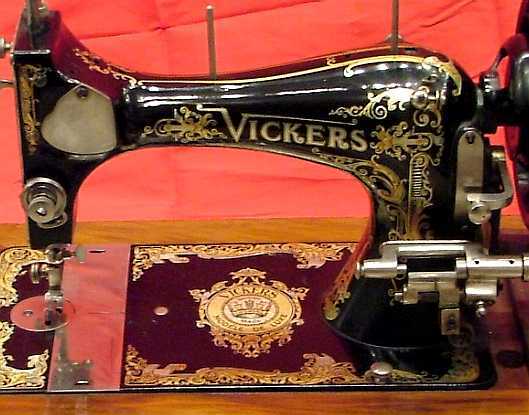 In the 1920’s along with flapper girls and prosperity the Vickers sewing machines flourished. Frister & Rossmann could not do much about the new competition and Vickers took away a precious market putting another nail in the coffin of poor old Frister's. Although the F&R name continued, it was in badge form only on many models (imported from around the world), the Berlin factory closed in the early 1920’s. It is worth reading my Frister & Rossmann History. Even if I say so myself! During the 1920's and 30's Vickers sewing machines flourished but rumblings from abroad and a new dictator in Germany spelled the end of the rise of Vickers sewing machine. Sewing machines were hard to make and less profitable than weapons! 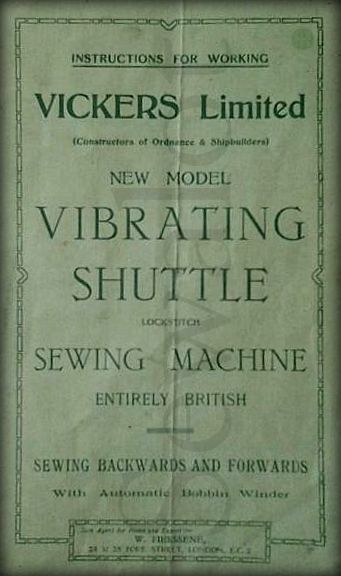 By the middle 1930's demand was so high for armaments for the next World War, Vickers shelved the poor old domestic sewing machine and concentrated on weapons, ships and planes. Just as well really or we may all be speaking German now! As storm clouds developed over Europe, the firm that had originally made machine guns, then sewing machines, went back to making to weapons of war once more. That was almost the end of Vickers from our little sewing machine saga. And so our chaotic world turns. Bebarfald - Vickers. This shows that Vickers were being sold in Australia in Bebarfalds desks. Right up until September of 1939 Vickers were selling sewing machines. Old retailers and suppliers like E Harris & Co of 46 Lafone Street, and Tooley Street, London, supplied them with their own 10 years guarantee, more of them later. The Vickers sewing machines were superbly built and lasted for generations. The early models were ornately decorated and still fetch a good price today, if working well. 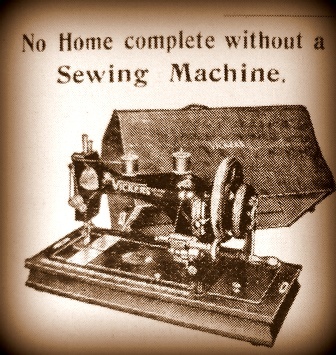 Vicktor sewing machine by Vickers. Entirely British! 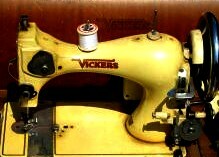 After hostilities Vickers produced a few more machines in a yellow-cream, model 7000, and the Vicktor sewing machine. Really just the early black ones with a modern spray finish. Also by now Vickers sewing machines and Harris & Co were probably one and the same company. Harris had been importing machines since the 1870's and now were supplying Vickers. (There is a possibility that Harris & Co bought the rights to the Vickers just at the outbreak of WW2 in 1939). 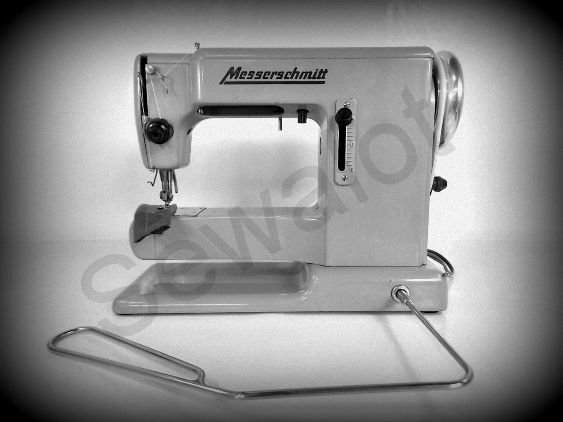 By the 1950's, with all other sewing machine companies bringing in new better machines, they became an obsolete model. Vickers/Harris did try and keep up but it was a losing battle. Foreign imports were wiping the floor with the higher cost British companies. This was one of the last models. The tie between E. Harris & Co Ltd of 46 Lafone Street, Tooley Street, & High Holborn, London, is pretty positive as much of the paperwork that has been turning up mentions them as manufacturers. I believe that Harris may have eventually bought up the rights and sewing machine factory to make some of the machines. I can't find a date or definite link but it will come eventually and all the missing pieces of this jig-saw puzzle will reveal themselves. To make things even more confusing enter BSM, more of them in a mo. However the main Vickers/Harris sewing machines factory was near Wimbledon. On the Morden Industrial Estate, South Wimbledon, Vickers had the unit on the corner next to the Lines toy and pram factory, just up the road from British Oxygen. The factory employed 40 engineers, two foreman and a manager. One foreman, Alf Watkins, was a stickler, even timing the men on their loo breaks. The factory made the machines from scratch. Rusty iron castings were delivered from the foundry to the factory where workmen like Reg Ray would shot-blast them and then engineers would machine out the rough castings. Reg lost the tip of one finger on a blasting machine so he remembers well the factory, the noise and the excitement of a huge engineering works. With no payment for time off work Reg was in a pickle but the other workmen had a weekly take and each week £10 was sent round to Reg and his wife until he could return to work. Every Friday a 10 ton lorry would call and be filled to the brim with new complete machines for distribution. The serial numbers were all taken down and double checked. Reg told me that one Friday the serial numbers did not add up when the machines were loaded for delivery to shops around the country. One machine was missing. The whole lorry was unloaded and checked, the lorry driver had pinched one of the machines and it was hidden in his cab! He was dismissed on the spot. As the years rolled on, production went down until Vickers/BSM/Harris, not willing to invest in improvements, finally gave up its sewing machine side. British Sewing Machines may have been a subsidiary of Vickers or Vickers may have sold the rights and possibly equipment to E. Harris & Co Ltd, who were involved with BSM ( I have yet to sort out the details of this but I will find out eventually) and now working out of Lombard Road and Morden Road, London. 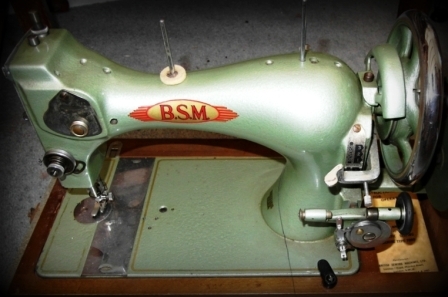 BSM, British Sewing Machines, continued to market the BSM sewing machine for many years, it was a good machine but basic and very heavy. 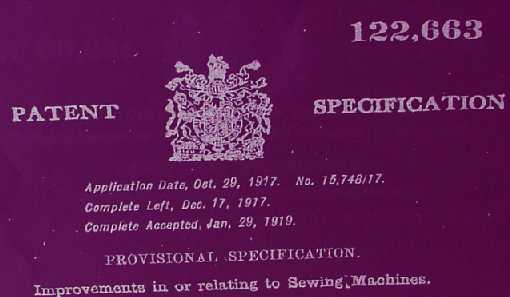 Certainly many early BSM sewing machines had Vickers paperwork with them. BSM made many thousands of these old fashioned machines over the next few years. Although the sewing machine sewed a treat, the machine itself was decorated in a plain style and by the 1960's was seriously dated and finally crumbled under the mass of imported modern lightweight machines from the Far East. The BSM was basically the same old machine as F&R and Vickers back from 1917 with a paint job, but sold hardly changed into the 1960's . 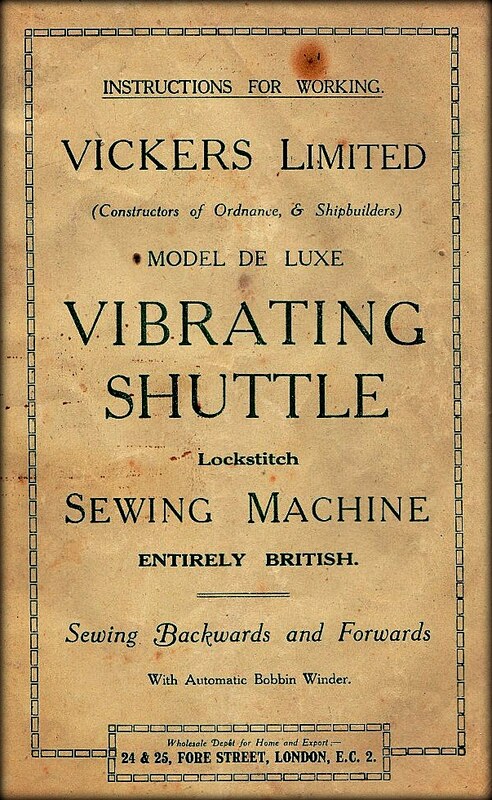 And so the brief history of Vickers and their sewing machines comes to an end. A sewing machine that really brought the old saying true as the company turned weapons into plough shears (well sewing machines but you know what I mean). are now available instantly on Kindle and iPad. 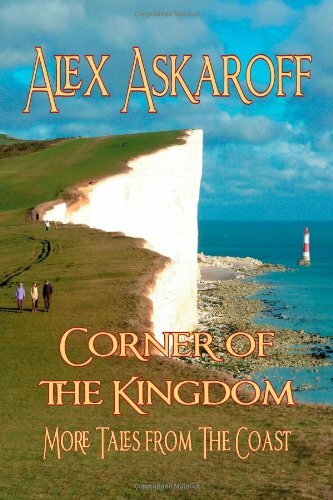 See all Alex's books. 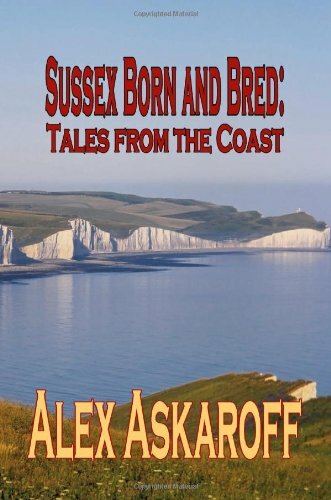 Alex's stories are now available to keep. Click on the picture for more information. I was happy to find your web site and that of British Made Machines. Seven years ago I was given the Vickers Modele de Luxe it's in wonderful shape and still has the working manual with it. But it didn't have the model number or any thing that would tell how to find out about it. And now there's your web site. I'm so pleased. We googled and found your info. Your Vickers Modele deluxe is identical to my granny's FR, apart from the decoration. Amazing! What an interesting story. Thank you for enlightening us! Thank you for being such a wonderful, interesting, funny, knowledgeable person. I was asked to help a friends sister find some info on her hand crank, since she didn't even know how to thread the machine she'd purchased (on Ebay). Just a quick 'google' led me to your site, and I've spent the last half hour reading all about the Vickers sewing machines. I've sent Deborah the links to some of your pages about her machine, and also the link to a Singer 28 VS manual. I even had to watch some of your youtube videos over again. I hope that Deborah gets as much enjoyment out of her machine as I did, just learning about it from your site. My Grandfather and Grandmother, my God-Mother's Husband and their son all worked for Vickers at the Crayford/Dartford works. "Uncle Harry" began as an apprentice back in the mid 1920's and ended up retiring as Managing Director in 1975. Harry even spent a couple of years in the mid 1930's in China for Vickers. I wish I knew more about that time of their lives. Gran was widowed (Influenza) in 1918, leaving her with a 5 month old baby, and took the only job she could; Cleaner at Vickers. Her parents moved in with her to baby-sit while she went to work at 3 am - 8 am. Vickers asked them to take in young Harry as a Lodger in a 'works house' on the housing estate (built by Vickers back in 1915 or so; to house their war-time workers). We went to England when Harry died in 1985 for the funeral; Mom felt she was literally his last relation, but since it was Christmas week felt she could not go alone and leave us in Ontario. So we had marvellous memories that Christmas going to his funeral in England. It was truly a celebration of his life. Vickers Armstrong, Vickers Armstrong, Vickers sewing machines. Vickers Supermarine.